Located in the Beaver Island archipelago in Lake Michigan, Squaw Island is the most northern of its four islands. While the much larger Beaver Island boasts a colorful history due largely to its one time self-proclaimed king, Squaw Island is home to one of the most attractive lighthouses in the Great Lakes. It is also associated with one of its most moving tragedies. Although the word ‘squaw’ is now regarded as pejorative and politically incorrect, it is thought the island was given that name because Native American women visited its shores in the belief that the island could somehow increase their fertility. Roughly a mile wide, the island is remarkably small. Its size was no doubt responsible for a town never being built there. However it became home to a lovely Victorian lighthouse, one of the most beautiful in all the Great Lakes. Six miles north of Beaver Island, Squaw Island sits at the western edge of Grays Reef Passage. This passage is the main route between the Straits of Mackinac and Lake Michigan’s southern harbors. Marked by a rocky lake bottom and an eight-mile stretch of shallow water, these shoals present a hazard for ships navigating this route. By the late nineteenth century, the transport of iron ore from the waters of Lake Superior led to a sudden growth in traffic through the Straits of Mackinac. 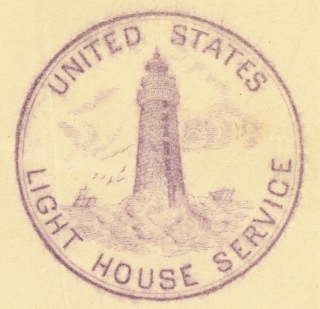 The need for manned lighthouses in the Passage became apparent, and Congress responded with funding for the construction of several light stations. One of the most northern of these light stations was built on Squaw Island. Just eleven miles south of the Upper Peninsula, ships approaching the island even ran into waters less than six feet deep, and the need for a lighthouse there was obvious. In 1891 Congress appropriated $25,000 for a new light station on the island. Construction was completed in September 1892. The octagonal Squaw Island Light was literally one of a kind. Built of dark red brick and trimmed in white wood, its sharply steeped roof only added to the station’s aesthetic beauty. Powered by a 10-inch steam operated fog whistle, the lighthouse used a fixed red light. Flashing every 15 seconds, the Fourth Order Fresnel Lens’ red beam could be seen for 14 miles. The station had two bedrooms, a watch room, lantern room, two-seater outhouse, wood-framed barn and both a dining room and sitting room. Unfortunately after the lighthouse was abandoned, it suffered a number of depredations due to vandalism. Still its once elegant beauty can be discerned in what remains of the light station’s tile floor, wooden staircase, wrought iron railing and spiral stairs leading to the tower. The first head keeper of Squaw Island Light was William H. Shields, who arrived at the station in October 1892. Since the original structure was too small for the families of both the head keeper and his assistant, the building was expanded two years later. Weather on the Great Lakes can turn on a dime – or just a shift in the wind. And lighthouse keepers knew that the beginning and end of shipping seasons usually presented the most unpredictable weather and the greatest danger. Unfortunately in the early years of the Lighthouse Service, keepers and their families had to make their own way on and off the islands they had been assigned to. One of the greatest tragedies involving a keeper and his family occurred at the close of a Squaw Island Light season. The shipping season officially over, Keeper Shields and Assistant Keeper Owen McCauley closed the light station on December 14, 1900. An open 25-foot Mackinaw sailboat lay ready to transport Shields, his wife, her niece Lucy Davis, McCauley and the second assistant keeper Lucien Morden. (Luckily, Assistant Keeper McCauley’s wife Mary was not with them at this time since she was awaiting the birth of their daughter on Beaver Island.) Also on board was Fids, Shields’ shepherd dog. Being mid-December, it was cold, and visibility was poor due to a 15-foot high vaporous fog over the water. However there was a wind blowing in from the northeast, which the party hoped should get them to St. James Harbor in only two hours. 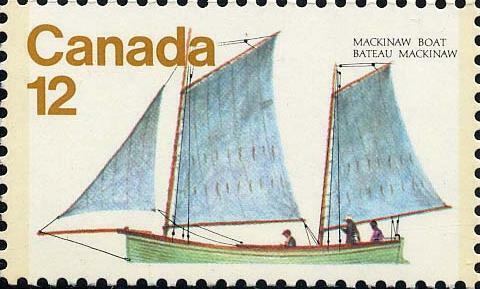 But the nine-mile trip to St. James Harbor on Beaver Island did not go as planned. The wind quickly dropped, then picked up at several intervals. After one of these periods of calm sea, followed by strong wind, their boat was hit by a winter squall. When the overbalanced vessel tipped over, McCauley jumped to the other side of the boat while the rest of the party fell into the icy water. He quickly pulled everyone out onto the capsized boat. Although a fishing tug was sighted rounding Beaver Island, they were too far away to be seen, even though the squall had cleared away the fog. Using rigging lines, the men tied Mrs. Shields to the centerboard, while Morden tied Lucy Davis with a foresheet. Tragically, there was little space left atop the capsized boat and the women’s feet and lower legs remained in the icy water. Tied down and unable to move, the wet women were horribly exposed to the elements and began convulsing with chills. The dog Fids, exhausted by the cold and waves, sank and died. A distraught Lucy Davis soon gave up hope and sang ‘Nearer My God To Thee’ before drifting off to sleep. She was found dead about 6:30pm. Second Assistant Morden declared that he would be the next to die. He was sitting on top of the capsized boat, gripping onto the jib sheet even though his hands were numb and swollen from the cold. Battered by the freezing winds, Morden gave a great shudder and lost his grip on the sheet. A moment later, he tumbled into the water and soon sank despite McCauley’s effort to save him. By dawn, only Shields and the 31-year old McCauley were left alive. They clung to the hull of the boat, while Mrs. Shields’ dead body floated beside them in the water. McCauley kept hitting and kicking the delirious Shields to keep him awake. At one point Shields complained that he would prefer dying from the elements rather than being kicked to death. Snow squalls sprang up, worsening conditions for the cold and hungry men. Shields and McCauley retied themselves and tried to more about - both to prevent freezing and to be able to stand up should a rescue ship appear. At midmorning, just such a ship appeared, and McCauley was able to wave the steamer over. 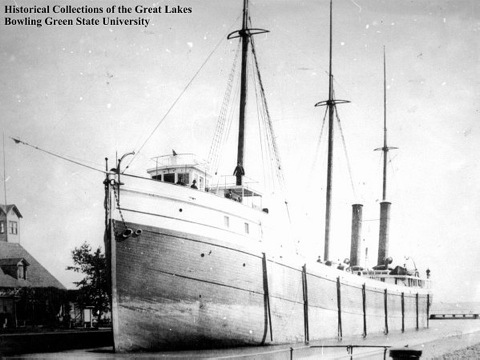 The ship Manhattan belonged to the Gilchrist Shipping Company and was en route to Manitowac, Wisconsin. Both men were taken aboard the steamer along with the frozen and ice-covered bodies of the women. The steamer’s crew members were amazed the men had survived 23 hours on the lake in such conditions. When they reached Manitowac, the men were transported to Holy Family Hospital. William Shields suffered from frostbitten hands and feet. He remained at the hospital for another six months, with one of his legs having to be amputated at the knee. One side of his body remained paralyzed. When Shields was finally released, he was appointed keeper at the new lighthouse station at Charlevoix, which was regarded as an easy assignment. Even so, an assistant keeper performed most of the duties while Shields supervised. He kept the light at Charlevoix until his 1924 retirement from the Service. Shields died the following year. As for Assistant Keeper Captain McCauley, he recovered quickly and was released from the hospital just days later. It was apparent that his rubber sea boots and long woolen underwear had helped him weather the elements. On December 26 he returned to his native Beaver Island where his pregnant wife Mary eagerly awaited him. 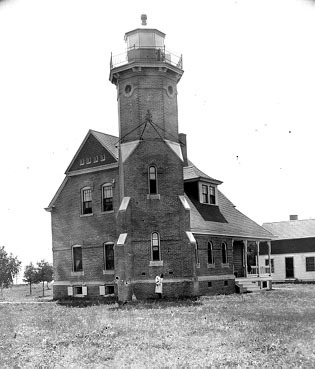 He was promoted to Head Keeper at Squaw Island Light, remaining there until the station closed in 1928. 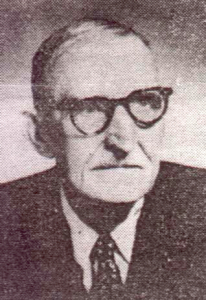 McCauley was next transferred to St. Joseph Light, and finally retired in 1936. He died in 1958. In 1928, the Lansing Shoals Light Station began operation, rendering the light on Squaw Island obsolete. Once the station was deactivated, the abandoned building began to deteriorate due to neglect and vandalism. Restoration on the light station is currently underway, but since it is privately owned, visitors are not allowed into the building at this time. In fact the entire island is privately owned, and people are discouraged from landing on its shores. With luck however, Squaw Light Station will be restored and the rest of the world finally able to appreciate what was once regarded as the most beautiful lighthouse in the Great Lakes.